Faster than a grouse’s wing tip, sleeker than a pheasant’s tail feather – The new Caesar Guerini Ellipse EVO Light represents the next generation of upland game gun. 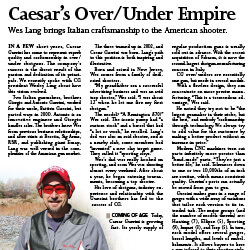 Through the use of special light weight alloy, Caesar Guerini has created the first and only ultra light round body over-and-under shotgun. Special stainless steel breech inserts guarantees long term durability. Our new engraving and surface finishing creates an alloy action that is as elegant as the steel version. The Ellipse is simply the evolution of the fine over-and-under hunting gun. All Caesar Guerini field guns come with a velvet lined lockable hard case and five precision flush chokes (CYL, IC, M, IM, F). A plastic choke case is also included. Avg. Weight* 5lbs. 6oz. 5lbs. 5oz. Drop at heel 2.25" 2.25"
Length of pull 14.75" 14.75"
Cast at heel .12" .12"
Cast at toe .3" .3"
Breech to comb 7.5" 7.5"